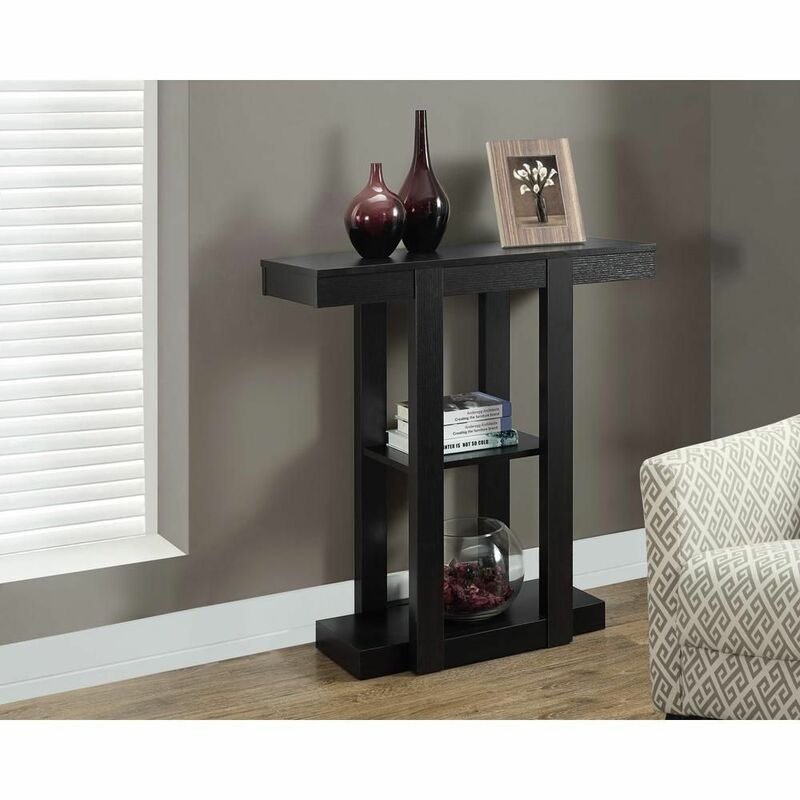 Make a statement in your living room or hallway with this stylish hall console table finished in a warm cappuccino. Ample surface area and a three-tiered design make this piece perfect for displaying your favorite decorative items or pictures. With bold edges and straight lines this table is an eye-catching must have for any living space. This highly functional rectangular side accent table, constructed from quality MDF material and finished in a classic cappuccino will easily become the most useful furniture item in your home! With plenty of space on top to place a few books or a phone, the table has a built-in dual glass or cup holders and glide it out further to reveal a hidden drawer that is perfect to store remotes or anything you need within easy reach. The handy bottom shelf offers additional storage. This compact and stylish accent table works perfectly as an end table, set between two chairs in a living room, family room, or even as a nightstand in your bedroom. Assembly is required. 32" Long Hall Console Table in Cappuccino Make a statement in your living room or hallway with this stylish hall console table finished in a warm cappuccino. Ample surface area and a three-tiered design make this piece perfect for displaying your favorite decorative items or pictures. With bold edges and straight lines this table is an eye-catching must have for any living space.